Beginning with Version 4.7 it became possible to re-order columns in Details Mode and switch off columns to prevent them displaying at all. 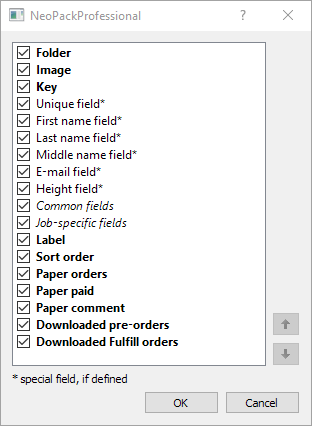 While it had always been possible to re-order subject fields in the Timestone Administrator (tsAdmin), 'system' fields such as the Folder, Image and Order columns were always in fixed positions and could not be moved. Furthermore, columns were always visible even if they were not used. With the new functionality it therefore became possible to customize the appearance of Details Mode as needed by the operator at the time without affecting other users - moving columns to their desired positions and hiding columns that were not needed. For example an operator may choose to move the paper order column next to the subject name fields while at the same time electing to hide the Key and other system fields that are not required. Different column types are displayed differently.